Hello Friends! It’s a three day weekend for me….BoomYaaaa! So love working in the school system as we get so much time off! Definitely a perk that is for sure! 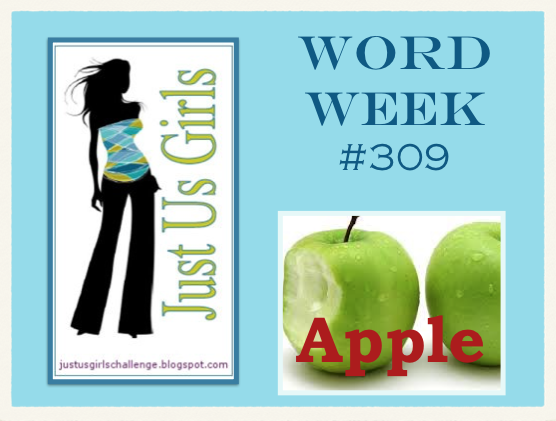 Anyways, today over at Just Us Girls it’s word week and our word is Apple. Perfect word for fall, don’t ya think? This was a little bit of a challenge for me as I have zero fruit stamps, much less and apple. So my job came to the rescue again as we have these cute tiny apple die cuts in our resource room. Second perk of my job…access to so many dies!! The paper is a Love pack from Recollections and it already had that cute little banner on it. When I was done with my card and paper piecing my apples together, it just looked blahza. So I decided to replica my own banner flags over top the existing ones and I think that did the trick! I am going to send this card to a former-coworker that retired last school year. 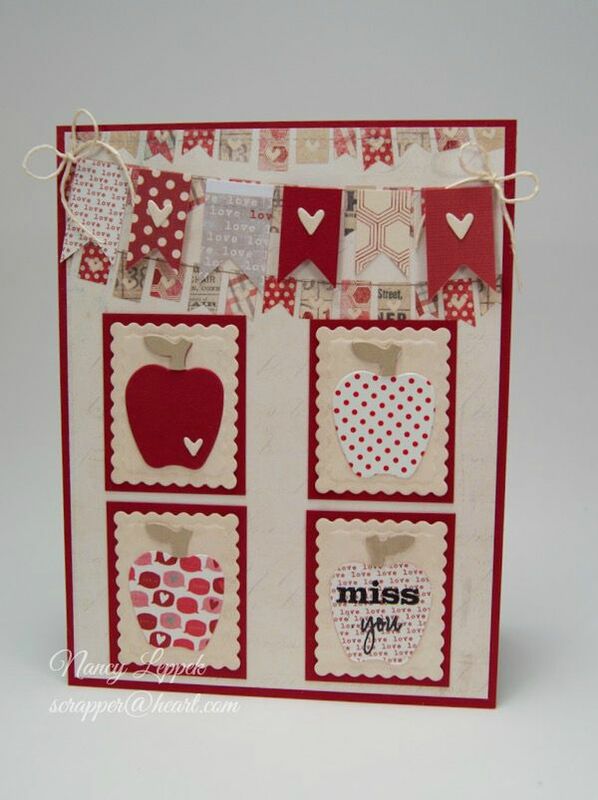 Cool card and great way to make the apples. How do you like them apples?!?! LOVE em’ lol. Aren’t they just the sweetest!!! Fun card, love your design and execution, so pretty! Love your card Nancy. The apples are so cute and love the banner across the top. Sweet, Delicious Apples. Lol Super cute with lots of the banners in the background and then on top too. Way to work those resources! Have a wonderful weekend! Love the different patterned apples! The additional banner you made really finished this off perfectly. Great design! Pretty colors and papers….love those fun apples! Lucky you to have these dies at school! Such a fun card! Love it! Good luck this year! Fabulous card. Lucky you being able to use some school supplies. Great layout with those banners. How lucky that apples are there for the taking in the resource room at school! What a wonderful card. I love the mix of patterned paper! This is a beautiful DT card!! Thanks you for taking the time to view my entry for this challenge and for the lovely comment. Very cute card and I love the colour scheme. The banner looks great. I love the added touch of your own banner with the colorful apples, Nancy.